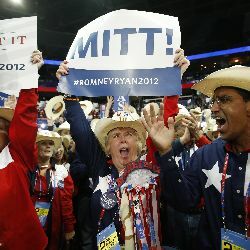 By Willoughby Mariano on Wednesday, August 29th, 2012 at 6:00 a.m.
Texas delegates cheer as Mitt Romney is nominated as the GOP candidate for president at the Republican National Convention in Tampa, Fla. Tuesday. GOP national committee chair Reince Priebus: Mitt Romney "gave away his father's inheritance." Romney’s father, George, was chief executive of American Motors Corp. and a three-time governor of Michigan. But while Romney’s father may have been well-to-do, Republicans have emphasized that Romney made his millions on his own. Priebus made this statement to interviewers Sunday. A related claim by Romney that he "didn’t inherit money" from his parents rated Half True. He told interviewers he donated his inheritance to Brigham Young University. We haven’t seen his father’s will, nor a receipt from Brigham Young. But there’s a strong circumstantial case that Priebus is correct. Romney has repeatedly said so himself, and Brigham Young named an institute for his father that was launched shortly after his death. There’s no reason to think Romney would have needed the money a decade after his lucrative move to Bain Capital. If any new evidence emerges, we'll review it. In the meantime, we rate Priebus’ claim True. GOP candidate for president Mitt Romney: "Half the kids coming out of college this year … can't find a job, or a job that's consistent with a college degree." Romney said this during a rally at St. Anselm College in Manchester, N.H., on Aug. 20. Romney spokesman Ryan Williams pointed to articles by The Associated Press and Time.com as evidence. The AP article is based on research by the Center for Labor Market Studies at Northeastern University, which in turn is based on data from the federal Current Population Survey and Labor Department measures. Our analysis and information from Andrew Sum, the Northeastern professor who did the research for the AP story, found Romney interpreted the data right. Even in strong economic times, a sizable percentage of recent college grads is either unemployed or employed in jobs below their abilities. Still, the current rate is the highest it’s been in at least 11 years. We give Romney a True. Top Obama campaign aide Stephanie Cutter: In the past 27 months, President Barack Obama has created more private-sector jobs than "in the Reagan recovery." Cutter made this claim in the run-up before the Republican convention in an interview on MSNBC's "Morning Joe." But however you slice it, it hasn’t, according to the Bureau of Labor Statistics, the nation’s official scorekeeper on employment. Cutter cherry-picked. She counted the past 27 months -- the most favorable measurement for Obama. She also chose private-sector job numbers instead of overall jobs. Between March 2010 and July 2012, the number of private-sector jobs increased by 4.4 million. The low point for employment under President Ronald Reagan was December 1982. Fast-forward 27 months and the number of private-sector jobs increased by 7.7 million. Even more impressively, the Reagan recovery took place within a much smaller economy. The comparison is even more unflattering to Obama if you don’t cherry-pick. We rate Cutter’s claim False. Applying the same inflation-adjusted methodology that Ryan chose to show the $4,000 household income drop under Obama, median incomes actually fell $589 under Romney during his earlier stint as governor.